Summer is always a wonderful time of year. Beautiful greenery, flowers, wonderfully warm sun, crickets chirping under a warm starry night to lull us into a relaxing sleep. However, it is also the time of year that can be quite hard on pets and have potentially fatal consequences. We has pet owners need to be very mindful of the heat when it comes to our pets and know what to watch for and what activities increase the risk of Heat Stroke. Certain breeds are at higher risk for heat stroke; pugs, Pekinese, Persians or any flatter faced pet as well as heavier coated pets to maybe at risk for overheating. Hairless dogs and cats should never be left in direct sunlight as their skin has the same risk of burning as young child’s skin can. Being confined to a concrete or asphalt surface. Running on hot asphalt can result in burns to the pads. Being confined without adequate shade or water. Being muzzled in a warm environment. Pets with medical conditions such as heart disease, obesity, breathing problems or senior pets maybe predisposed to Heat Stroke. Try to always keep these pets cool and in the shade. 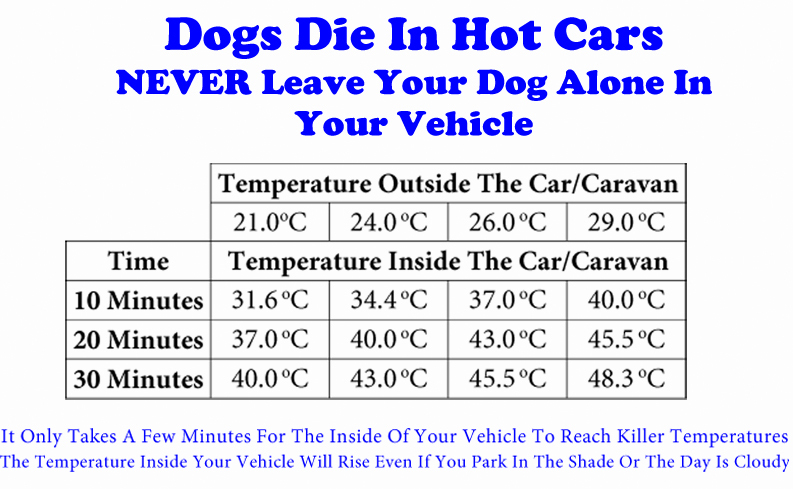 Never leave your pet unattended in a car on a summer’s day. Use the graph below to determine if maybe Fido or Fluffy should just stay home. What to do if you suspect your pet has heat stroke? If you suspect your pet has heat stroke seek immediate veterinary care. In the mean time initiate active cooling by moving your pet to a cool environment and try to place a fan directly over them if possible. Apply cool water or wet compresses to your pet’s neck, armpit and groin area. Cool water to the ear flaps and paws may also assist in decreasing the core temperature. Never use ice water as it actually slows down the body’s ability to drop the core temperature. Offer plenty of fresh water, but don’t force water down your pet’s throat. Please note only take your pets temperature rectally if you are 100% comfortable doing so. Even if you think your pet is okay it is best to see your veterinarian. They will double check your pet’s hydration and temperature to ensure your pet isn’t still suffering to a low grade heat stroke. In severe heat stroke cases side effects such as bloody diarrhea or organ failure may appear up to 24 hours later. HAVE A SAFE AND WONDERFUL SUMMER! ENJOY THE HEAT AND STAY COOL!